The best defence against serious dental problems requiring costly procedures to remedy, such as dental crowns, implants, or bridges, is to maintain proper oral hygiene. By preventing tooth decay and gum disease, you will be preventing oral health problems as well as secondary problems that can occur throughout the body as a result of poor dental hygiene. There are many strategies you can use to prevent oral health problems. You should brush your teeth at least twice a day to remove all of the plaque that has accumulated on them from eating throughout the day. The acids and bacteria in plaque can begin eating away the enamel of your teeth in as little as 20 minutes. For this reason, you should always brush your teeth before going to bed so that the plaque is not destroying your teeth while you sleep. You should also floss after each meal to remove food particles that are stuck between your teeth, which brushing may not fully remove. You should also use a microbial rinse containing fluoride after brushing. This will help reduce the amount of bacteria in your mouth, and the fluoride will strengthen your teeth, helping to prevent tooth decay. Another important aspect of preventive dentistry is visiting your dentist at least twice a year for teeth cleaning and a check up. X-rays will be taken to ensure that you have no cavities that are not yet visible to the naked eye and to check for problems that may be occurring below the gum line. The dentist will clean your teeth to remove the tartar build up, and check the condition of your gums to ensure that you do not have gingivitis or a more severe case of periodontal disease. The dentist will also perform an oral cancer screening on you annually. All of these procedures are important for keeping your teeth and gums healthy and preventing serious oral health problems from occurring. 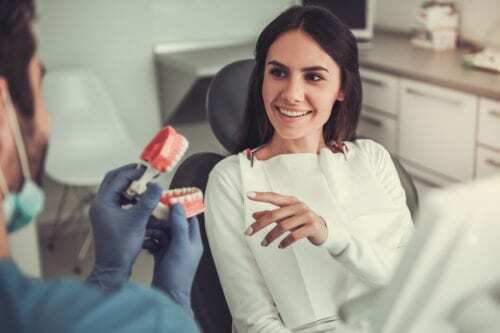 In addition to maintaining proper oral hygiene at home and visiting the dentist at least twice a year for check-ups and cleaning, there are several other strategies you can follow for preventive dentistry. If you play sports or grind your teeth, you should use a mouth guard. This will prevent teeth from being chipped or broken and also the wearing down of the enamel of your teeth, which makes them more vulnerable to decay. You should also undergo orthodontia procedures to straighten teeth, as crooked teeth are much harder to keep clean, and gaps can make the sides of adjacent teeth more vulnerable to decay. Preventing oral health problems is much easier than fixing problems once they occur. To know more about our preventative dentistry methods.